US Manufacturer of industrial counterweights for forklifts and backhoes. Gray iron castings from 100 to 5000lbs. Chinese foundry of ductile iron, gray iron, alloy iron, cast steel, and non-ferrous alloy iron. Chakan Foundry and Pefco Foundry are frontliners in centrifugal, shell and conventional castings in S G iron, cast iron and alloy steels. Cast iron, steel, aluminium, bronze, ferrous and non ferrous metal castings, foundry equipment, services, binders and foundry consumables. Foundry that produces class 25 through 35 gray iron castings. A gray and ductile iron foundry specializing in complex, highly-cored, short-run, and prototype castings. Manufacture gray iron and ductile iron castings used in water distribution, drainage, and sewerage. Includes product specifications and photographs. Russian manufacturer of steel, gray iron and ductile iron castings with weight from 5 to 6000 kg and size from 50 to 2000 mm. Includes product gallery, details on processes used. Foundry of ductile iron and steel. Products include manhole covers, ductile iron fittings for PVC pipes, and industrial casting parts. Foundry located in Mexico, with sales office in California, producing broad range of grey iron and iron alloy castings. Site includes examples of end products and details of markets served. Ductile iron foundry with complete in-house, intermediate and high volume molding, austempering, machining, and assembly. Products include austempered ductile iron. Manufactures aluminum, bronze, iron castings including historical markers, plaques, architectural cast iron, furnace grates (parts), machine castings. Small-jobbing foundry with a complete pattern shop. Foundry and fabrication company located in India producing broad range of cast iron, cast steel, and stainless steel castings. Main focus is on pipes and fittings for the chemical, paper, and fertilizer industries. Features this gray iron foundry producing castings for tools and machines. Provides grey iron castings created to exact specifications. Located in Perry, Iowa. Features ferrous castings, gray iron, ductile, and green sand. Gray and ductile iron castings and machining, including CNC turning, milling, tapping and grinding. Matches casting suppliers, ductile iron suppliers, tool steel suppliers to the foundry, for brass castings, bronze castings, or ductile iron castings. Produces sand that is used for casting and molding in the iron, non-ferrous, and manganese steel foundry industry. Manufactures gray, ductile, thin wall iron casting as well as stainless steel parts. Based in Taiwan. Offers gray and ductile iron castings ranging from 1,000 to 150,000 pounds. Also provides heat treat, painting, and machining services. Foundry producing castings in modular, vermicular iron, alloyed cast irons utilizing shell-moulding technology. Offers commercial gray iron castings and one of a kind castings from original parts. Manufacturing iron oxide pigments including iron oxide red, iron oxide yellow, iron oxide black, and iron oxide brown. Manufacturer of machine accessories for casting iron, ductile iron, and gray iron. Provides custom castings in NiHard, HiChrome, Ductile Iron, Corrosion resistant, and heat resistant alloys. Based in Vancouver, BC, Canada. A custom gray and ductile iron casting company producing components for specialized equipment manufacturers. Located in Xenia, Ohio. If the business hours of Rowe Foundry, Inc in may vary on holidays like Valentine’s Day, Washington’s Birthday, St. Patrick’s Day, Easter, Easter eve and Mother’s day. We display standard opening hours and price ranges in our profile site. We recommend to check out rowefoundry.com for further information. 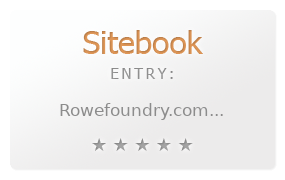 You can also search for Alternatives for rowefoundry.com on our Review Site Sitebook.org All trademarks are the property of their respective owners. If we should delete this entry, please send us a short E-Mail.